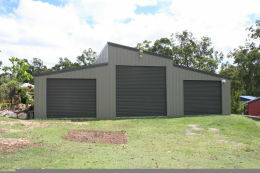 4x9x2.4, with 1 roller door 2.7w , and 1 x pa door. Region A: $6,290 full Colorbond, or $6,048 with a Zincalume roof. Region B: $6,498 full Colorbond, or $6,350 with a Zincalume roof. 5x9x2.4, with 1 roller door 2.7w , and 1 x pa door. Region A: $6,895 full Colorbond, or $6,650 with a Zincalume roof. Region B: $7,110 full Colorbond, or $6,898 with a Zincalume roof. Shed Kits available for delivery to selected areas. Shed kits on sale until 3pm Tuesday 30th April 2019. 6x6x2.4, with 2 roller doors 2.7w. Region A: $5,500 full Colorbond, or $5,340 with a Zincalume roof. Region B: $5,625 full Colorbond, or $5,458 with a Zincalume roof. Have a barn with a difference! 12mx12m, with 2 roller doors 2.1h and 1 roller door 3m high. Region A: $15,980 full Colorbond, or $15,290 with a Zincalume roof. Region B: $17,190 full Colorbond, or $16,520 with a Zincalume roof. 12mx16m, with 2 roller doors 2.1h and 1 roller door 3m high. Region A: $19,080 full Colorbond, or $18,190 with a Zincalume roof. Region B: $20,600 full Colorbond, or $19,750 with a Zincalume roof. 3.5mx10.5m, with a 3.5mx10.5m awning. 1 x Roller Door 3mh x 2.74w, and 1 x pa door. Region A: $10,590 full Colorbond, or $10,250 with a Zincalume roof. Region B: $11,550 full Colorbond, or $11,240 with a Zincalume roof. Free standing Patio for less then $5000 Super special! 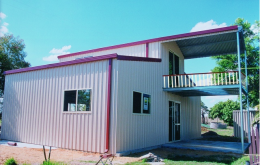 Dutch Gable 5x5x2.4, Colorbond Roof and Trims with square galvanised post only $4,925. Or grab a 6x6x2.4 for $5,550. Available in other sizes. Can be used as a patio or carport. Delivery to selected areas. Prices for Region A & B. *Cyclonic prices on request. Carport kits on sale until 3pm Tuesday 30th April 2019. Large Workshop to suit all needs. 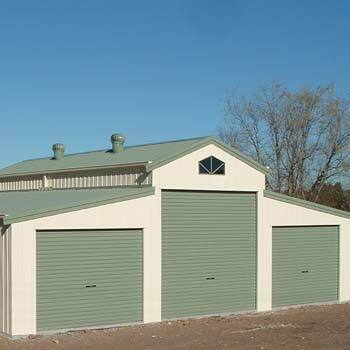 This shed is 9 x 20 x 5.4, and boasts 3 large Chain operated roller doors 4.6h x 4.3w. It also has one pa door, 6 windows, and has a one bay mezzanine floor (5m x 9m). Ideal as a truck or farm Workshop. Region A: $38,250 full Colorbond, or $37,420 with a Zincalume roof. Region B: $39,750 full Colorbond, or $38,960 with a Zincalume roof. Delivery Included to selected areas. Mezzanine floor supplied as bearers & joists only. Flooring & stairs not included. Larger than standard garaport with 2 roller doors and a glass sliding door. Region A: Colorbond walls & trim, Zinc roof: $10,240. Colorbond all over: $10,620. 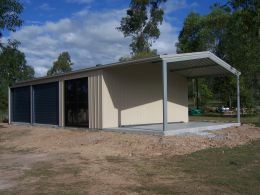 Region B: Colorbond walls & trim, Zinc roof: $10,490. Colorbond all over: $10,850. 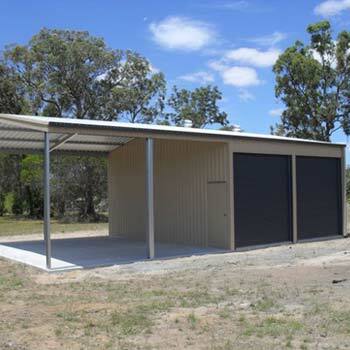 Region A: Colorbond walls & trim, Zinc roof: $11,370. Colorbond all over: $11,740. Region B: Colorbond walls & trim, Zinc roof: $11,590. Colorbond all over: $11,980. Wow! Comes in 3 sizes and includes a mezzanine floor, 4 windows and 2 glass sliding doors. Barn 1: Downstairs 10.5m x 7m, Upstairs 3.5m x 7m with a 3.5m x 3.5m verandah: $30,990. Barn 2: Downstairs 10.5m x 8m, Upstairs 3.5m x 8m with a 3.5m x 4m verandah: $32,990. Barn 3: Downstairs 12m x 8m, Upstairs 4m x 8m with a 4m x 4m verandah: $33,990. 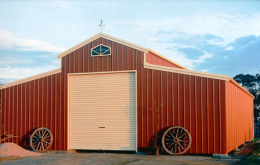 These Barns have Class 1 a engineering, and in addition to the below inclusions, come complete with vermaseal, and internal battens enabling you to line the shed. The engineering comes complete with a slab design to suit your soil type. Open plan, enabling you to plan bathrooms, bedrooms and kitchens to suit. Price includes 2 x glass sliding doors 2100h x 1810w, and 4 windows 0790h x 1274w. Includes the mezzanine floor structure (bearers & joists). To suit Region A (maximum 41m/sec) & Region B (maximum 51m/sec). Price does not include internal walls, balustrade, stairs, stair void, rails or flooring for the mezzanine. The shed you always wanted is here. 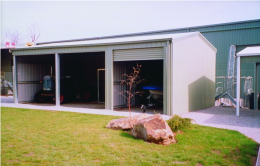 With 2 open bays and one enclosed bay with a roller door, this is the right shed for all your storage. Size is 6 x 10 x 3.3m. 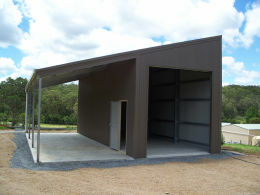 Region A: Colorbond walls & trim, Zinc roof: $8,140. Colorbond all over: $8,420. Region B: Colorbond walls & trim, Zinc roof: $8,650. Colorbond all over: $8,940. Available in 2 sizes, with 4 open bays, and one enclosed bay with a 3m tall roller door. Farm Tough! 9.5x9x3.6 American Barn with one roller door 3m high x 3m wide. Region A: $11,270 Full Colorbond, or $10,860 with a Zincalume roof. Region B: $11,780 Full Colorbond, or $11,370 with a Zincalume roof. *Cyclonic prices on request. Windows extra. Shed is ideal for Rumpus room, home office or maybe a weekend retreat. Region A: $18,200 Full Colorbond, or $17,700 with a Zincalume roof. Region B: $19,190 Full Colorbond, or $18,670 with a Zincalume roof. Replace the horizontal weatherboard look with horizontal corrugated, and the shed is $1,800 cheaper. Replace the horizontal weatherboard look with Vertical K-panel, and the shed is $3,500 cheaper. *Price includes 1 x glass sliding door and 2 windows 0790h x 1274w (larger window not available). 12mx12m, with 2 roller doors 2.4h and 1 roller door 3.4m high. Region A: $18,990 full Colorbond, or $18,400 with a Zincalume roof. Region B: $20,400 full Colorbond, or $19,690 with a Zincalume roof. Does not include skylights or motorhome. 6m x 18m x 2.7m with 6 roller doors. Region A: $12,990 Full Colorbond, or $12,480 with a Zincalume roof. Region B: $13,690 Full Colorbond, or $13,140 with a Zincalume roof. *Window not included. Cyclonic prices upon request. Delivery Included to selected areas. 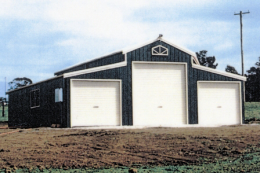 10.5 x 12 x 3.6 American barn with 3 roller doors. Region A: $14,690 Full Colorbond, or $14,090 with a Zincalume roof. Region B: $15,350 Full Colorbond, or $14,740 with a Zincalume roof. 5x5x2.4, 15 Degree Gable Patio with Gable infills Only $3,890, or $3,990 with 22 degree pitch. 6x6x2.4, 15 Degree Gable Patio with Gable infills Only $4,540, or $4,690 with 22 degree pitch. Entertain your friends and family in comfort this summer, with this free standing Patio cover. 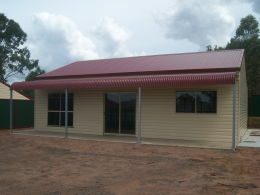 Colorbond Roof and Trims with square galvanised posts. Can be used as a Patio or Carport. Other sizes available. Delivery included to selected areas. Region A & B. *Cyclonic prices on request. Prices are in Zincalume, and includes delivery to selected areas. Importance level 1, Terrain Cat 2.5.